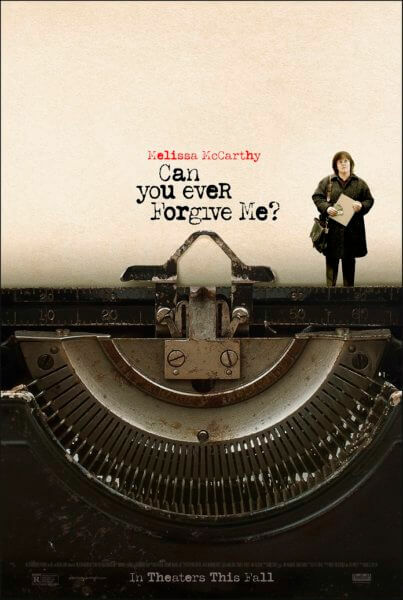 Fox Searchlight has released the full trailer for the dramatic film, Can You Ever Forgive Me?. The trailer sets up the story of writer Lee Israel who, after no longer being able to make a living off her books, resorts to forgeries to pay the rent. The 2018 theatrical release is based on a true story and was directed by Marielle Heller (The Diary of a Teenage Girl). Nicole Holofcener and Jeff Whitty adapted Lee Israel’s book for the screen. Lee Israel’s memoir was published in 2008 and was her fourth (and final) book. The cast is led by Melissa McCarthy (Mike & Molly, The Boss) and Richard E. Grant (The Hitman’s Bodyguard) and includes Dolly Wells (Pride and Prejudice and Zombies), Jane Curtin (The Librarians), Ben Falcone (Enough Said), Anna Deavere Smith (For the People), and Stephen Spinella (Royal Pains). The Plot: Melissa McCarthy stars in the adaptation of the memoir Can You Ever Forgive Me?, the true story of best-selling celebrity biographer (and friend to cats) Lee Israel (Melissa McCarthy) who made her living in the 1970s and ’80s profiling the likes of Katharine Hepburn, Tallulah Bankhead, Estee Lauder and journalist Dorothy Kilgallen. When Lee is no longer able to get published because she has fallen out of step with current tastes, she turns her art form to deception, abetted by her loyal friend Jack (Richard E. Grant).